Team ACCESS is in need of men and women volunteers to participate in this year’s Susan G. Komen Race for the Cure breast cancer walk in Detroit on Saturday, June 7. 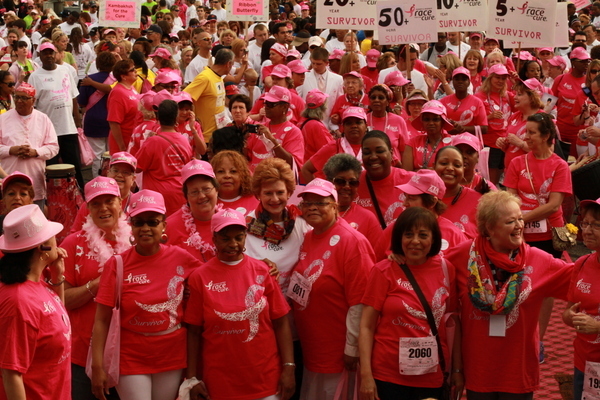 Join by clicking on the link, www.karmanos.org/detroitraceforthecure. On the first page, click on “Register Now” and then click on the “TEAM MEMBER REGISTRATION” option and join ACCESS Team. The event takes place at Chene Park on Detroit’s riverfront, with an opening ceremony at 8 a.m. Participants can sign up for the 5K race/walk or a 1-mile walk. Friends and family are encouraged to sign up for the walk. Arabic language registration forms are available. For more information, call Hiam Hamade, 313-216-2206. Since its inception in 1992, the Komen Detroit Race has raised and invested more than $25 million to support needs-based breast health programs in our community and fund breast cancer research in Michigan and around the world. Fees are the same as last year. Sleep In for the Cure registration closes May 20. All other individual online registration continues through June 5. All registrations include a race packet with 2014 T-shirt and numbered bib which must be worn at the event. Survivors receive an additional pink shirt and a commemorative lapel pin (pins will be available for sale to others). Children ages 5 and under are free but must be officially registered by a parent or guardian to participate.